Learning to match your shirts and ties together so they work well may be an art, but it's one you can learn. 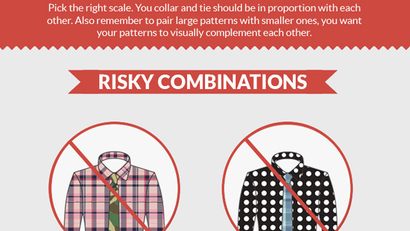 This infographic from men's designer footwear company Beckett Simonon shows you how to mix the riskiest kinds of shirts and ties: ones with patterns. The graphic offers examples for a few rules of thumb, such as starting with the primary colour of your shirt and pairing large patterns with smaller ones. One piece of advice I'm not so sure about is the tip to always wear a tie darker than your shirt (what if you're wearing black? ), but otherwise, these tips could help you avoid looking like an optical illusion. I'm not sure if I agree completely with this. In particular I think the "dimple" looks messy and shows a lack of care in properly arranging the tie knot. Likewise the "touch the waistband" advice is also suspect as it will eventually turn out being too short. Once your shirt comes untucked a little with wear, the separation between tie and shirt will show. It is better if the widest part of the tie is level with your belt buckle. When in doubt though, a little longer is always better, there's nothing worse than the short tie!